Backed by diligent professionals, we are providing highly reliable Decantor Repairs. We specialize in repair, maintenance and service of all models of decantor with state of art technology and latest equipments. Our offered services include vibration analysis and condition monitoring with special attention to balancing. We offer our clients high quality Rotor Repairing Service by using rotor KEC method. Rotor KEC is a method and apparatus for generating stator and rotor resistance estimate, including the steps of providing high frequency injection voltage signals to a three phase motor, rotating three phase feedback. 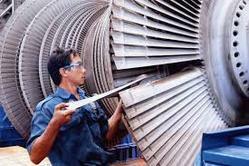 We have gained proficiency in Alternator Rotor Repairing Service. Our engineers do repairing of all alternator rotors in effective manners to eliminate all errors in less time. - Machining of Journals, Thrust Collars, Heat groove, cracks, etc. We are one of the leading organization instrumental in providing excellent Router Repairing services to our valuable clients. Furthermore, our assiduous professionals make sure that motor rewinding is done according to industrial standards. Our prices are affordable and our Router Repairing services are outstanding. We hold expertise in offering wide variety of Slip Ring Rotor Rewinding works to our clients. Our services are executed by our expert team of technicians under the supervision of our engineers. Some of the machines stop working due to their ware out winding coil. We at our advanced repair work shop use the finest quality winding coils for winding these machines. We have designed and fabricated a special rotor rotating drive train which is used to rotate the rotor during cases of severe damage to blades and unbalanced condition of rotor. CEL has a fully equipped, state-of-the-art rotor shop for complete gas turbine compressor rotor and power section overhauls. This facility has the capability of complete turbine and compressor rotor de-stacking, refurbishment, re-building and balancing. Our organization is rendering Alternator Rotor Repairing Service. This service is completed at low prices. - Inspection, repair, reconditioning of Top half of the Nozzle Plate of 62.5 MW GE make TG set, for APGENCO. 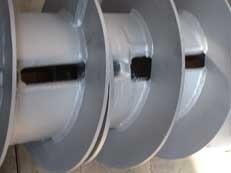 - Repair & reconditioning of MOP shaft assemblies for M/s Nalco.